Home entertainment is more fun and exciting than ever, with sophisticated and modern technologies that keep evolving. You can choose from the vast variety of TVs available on the market. There are so many types of screen sizes, resolutions, features, and much more. Also, there are many extremely affordable TVs that are really quality and well-packed. However, there are, of course, those much pricier models with lots and lots of advanced, fancy features and technologies that cost money. Therefore, shopping for a new television can be a quite overwhelming experience. Even the most careful and experienced shoppers can get confused, and retailers, TV manufacturers, different Internet sources, and salespeople can create even more uncertainty since they push new technologies, extra features, and add-ons day by day. The very first thing you need to do when shopping for a new TV, is to determine its purpose. Think about what you need the TV for, and start from there. If you are looking for a stunning, breathtaking, large-screen TV for home theater, loaded with new technologies and features, you should probably consider those 4K Smart TVs with screen sizes of 50’’, 60’’, 70’’, or even bigger. But, if you are in the market for a small screen TV, then this model is definitely worth considering. The Axess TVD1803-22 is ideal for use in spare room, kitchen, bedroom, office, or any smaller space in your home. But probably the best use of this TV would be as a gaming monitor. Anyhow, this TV packs some pretty cool features, and if you want a small screen TV for around $200, this is what this model has to offer. The sleek design of this TV blends perfectly with any room whether you choose to wall mount it or not. However, since this is a 22-incher, many people will probably choose to wall mount it in their kitchen, bathroom, or computer room. It is really easy to mount this nice, little, compact TV on the wall. Either way, the Axess TVD1803-22 is a great addition to any home. The HDMI port delivers great quality picture from any of your compatible media devices. It allows you to watch your favorite movies and shows in crystal clear 1080p HD quality. 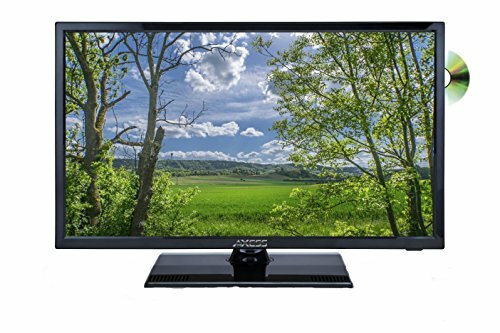 When it comes to inputs on this TV, it has USB input, HDMI input, PC audio jack, VGA (computer monitor), audio/video, cable/antenna RF, earphone audio jack, CVBS input, coaxial output jack, and S video input. This is not just a 22-inch LED HDTV it also boasts a DVD that is built-in to the back of the TV. This is a really nice addition that makes it a lot easier to watch your favorite movies. There is no need for buying an additional media player. The Axess TVD1803-22 can be used as gaming monitor, and it will perform amazing as one. If you want to get an amazing gaming experience, this model does a great job as ultra-clear gaming monitor. Make any video game come to life by utilizing the VGA input to immediately transform this television into a 1080p computer monitor.